A weekend of good food, good friends and close family. Grateful. It was Tweenie’s 12th birthday this month, and when asked what kind of cake she wanted, her answer was quick. Chocolate. Chocolate mudcake. The kid loves chocolate anything. If I introduced her to chocolate insects, she’d probably delight in another food group that she could just add chocolate to. She didn’t want a party, she just wanted to go to the Hellenic Club (biggest playground EVA) for dinner and have 3 friends for a sleep over. Bless her, she’s a simple girl, friends and family, those are the two things that make her world go round. That is not a flattering first thing in the morning photo of me, but my girl is too gosh darn gorgeous, I don’t care what I look like. 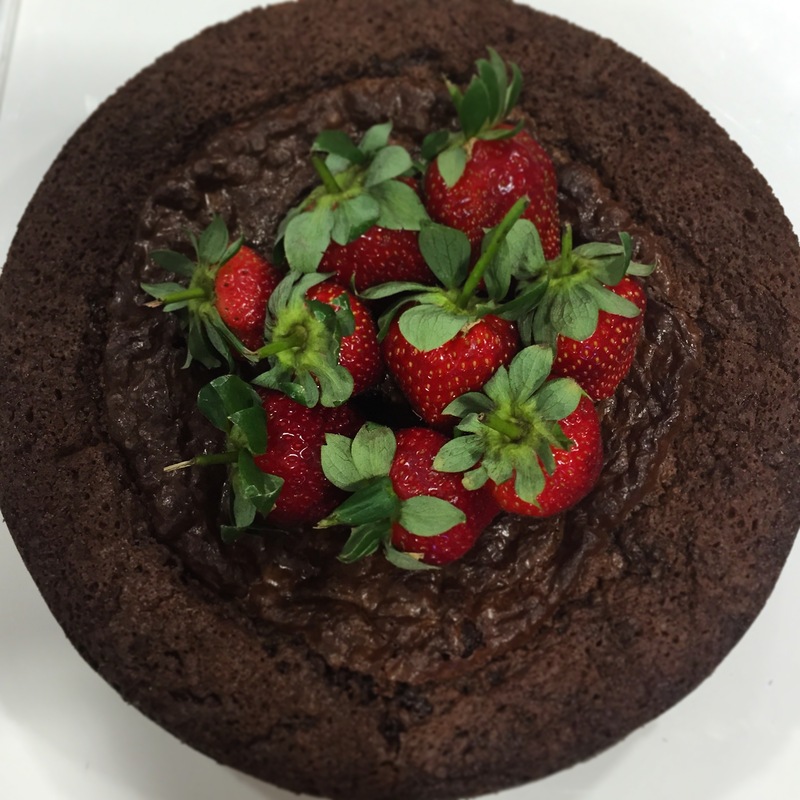 Do you know how many recipes for chocolate mud cake there are on the internet? 478,000 results in .042 seconds. If you’ve got a tried and true recipe that works for you, keep it. Do not lose it. I’m putting this recipe into my blog so I have a record of it forever. Because it worked. And it didn’t. Epic Fail on Tweenie’s birthday cake. My work colleagues were stoked, their’s was delicious. I took my recipe from the fantastically talented Claire K Creations. This cake has 203 comments, most of them are pretty positive, one dad thinks he’s retarded because he didn’t know he had to make the coffee up before he added it to the mix, completely her fault, of course, lol. It created so much conversation that I simply had to give it a go. Claire’s got literally millions of recipes, and they all look pretty damn good. I wish I had half her talent, and time. It really was my own fault that I failed so spectacularly. I made the first cardinal sin of baking. I doubled the recipe. GASP, you did what? I know, I know, I doubled the recipe, what the freaking hell did I think I was doing? Did I think I was Martha Bloody Stewart, and could double a cake recipe and just glibly expect that it’d turn out? Yep. Look at the damn thing. 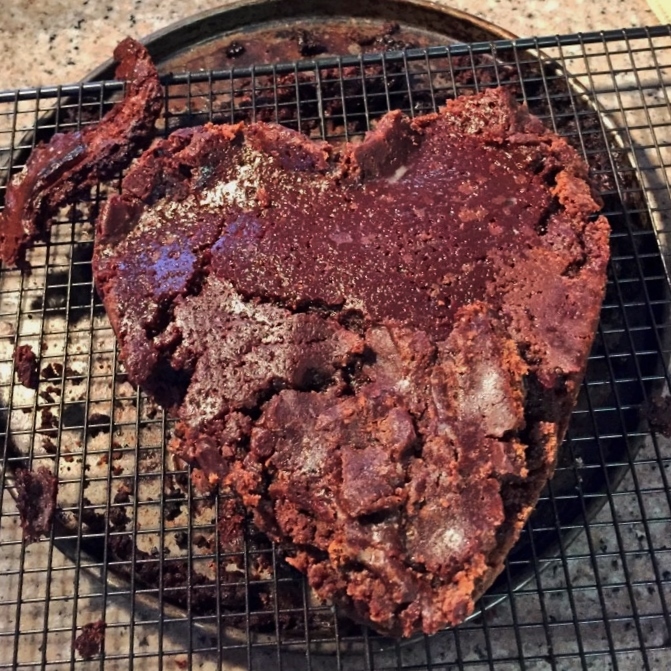 It has to be one of the ugliest mud cakes you’ve ever seen, it was going to be the sweetest heart cake ever. But, on the flipside, heated up in the microwave and hidden by double cream, it tasted pretty ok. This little beauty worked a treat. I baked both at the same time in the same oven for the same length of time. I probably won’t do that again. I did get some tips from a couple of professional bakers, so I’ll tweak this recipe a little next time, I will be using this recipe again, believe you me. I’ll probably only bake one at a time though. 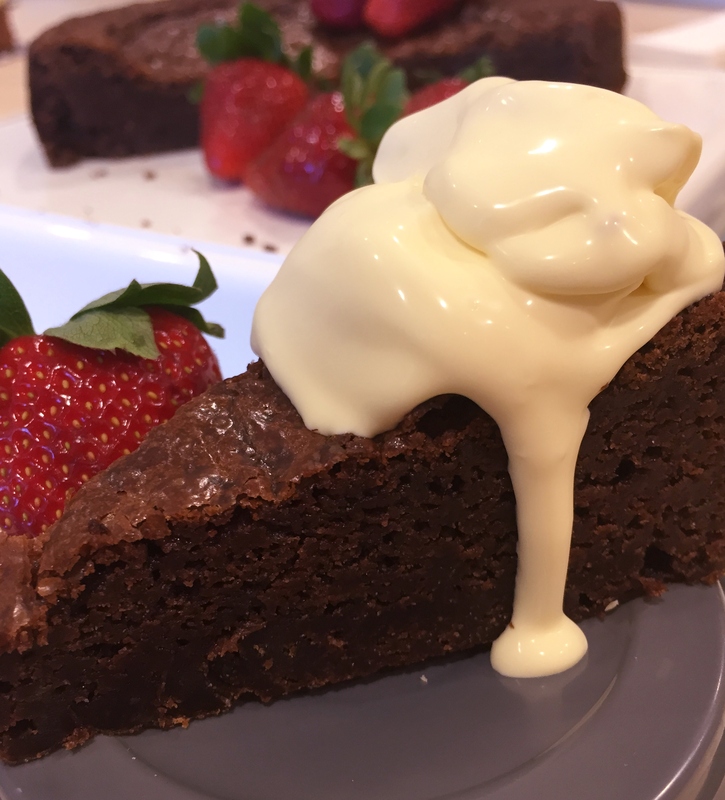 Served up with King Island double cream and strawberries, crunchy on the end bits and moist and slightly fudgy in the middle bits. Made with dark chocolate and 70% dutch cocoa, it was a slice of decadence on a plastic plate. I don’t think it needed icing, the crispy bits on top are my favourite anyway. What did Tweenie celebrate her birthday with? A mud cake from a shop 😦 And was it every bit as good? Not even close. The kids, after eating mine for afternoon tea, refused to eat it at the restaurant and I’ve had to give the damn thing away. 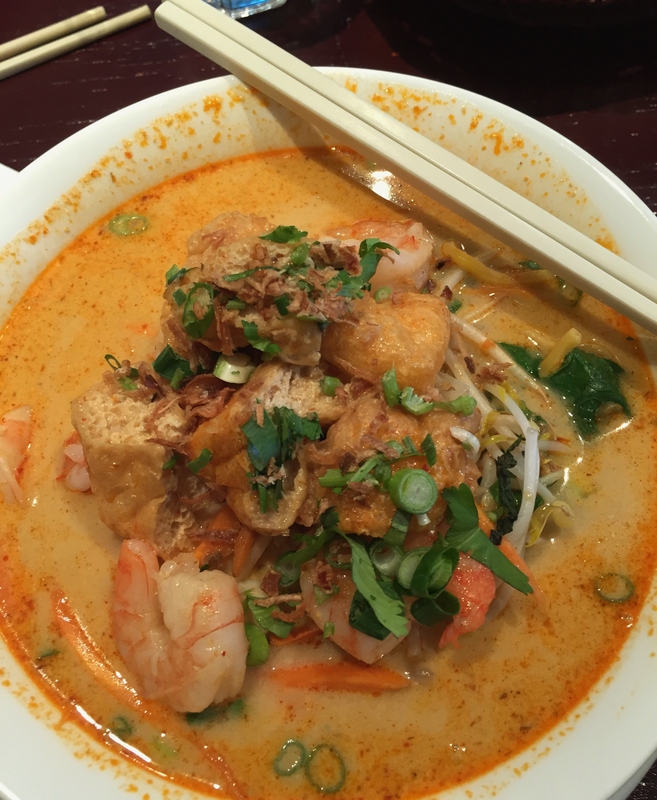 On Saturday myself and several Canberra Bloggers set out on a journey to taste test Canberra’s best Laksa’s. First stop was the Noodle Cafe in Garema Place. Could you imagine the sheer terror that would’ve coursed down the Cafe owner’s spine on hearing that 6 bloggers were headed their way to taste test their Laksa’s? Frankly I’m surprised they didn’t shut for the day. Pretty glad they didn’t, because they were some damn fine laksa’s. The lunch special for a Combination laksa – roast duck, bbq pork and chicken was only $10 or $11, I think. I ordered a prawn laksa with extra tofu and a Coke. Mine came to $21. Suffice to say, mine came in the biggest bowl, and was really, really, really good. My nose ran from the heat, but my throat didn’t burn. Although, I think my mouth was still on fire from tasting Joseph’s Nasi Goreng that was straight from the pits of a fiery hell. My laksa was hot, but not so piping hot that it burnt the tip of my tongue and the soup was tasty, real tasty. The veg were Chinese greens, hallelujah! I hate broccoli and cauliflower and carrot shapes in laksa. I want simple Chinese greens, a deeply tasty spicey broth and LOTS of tofu. 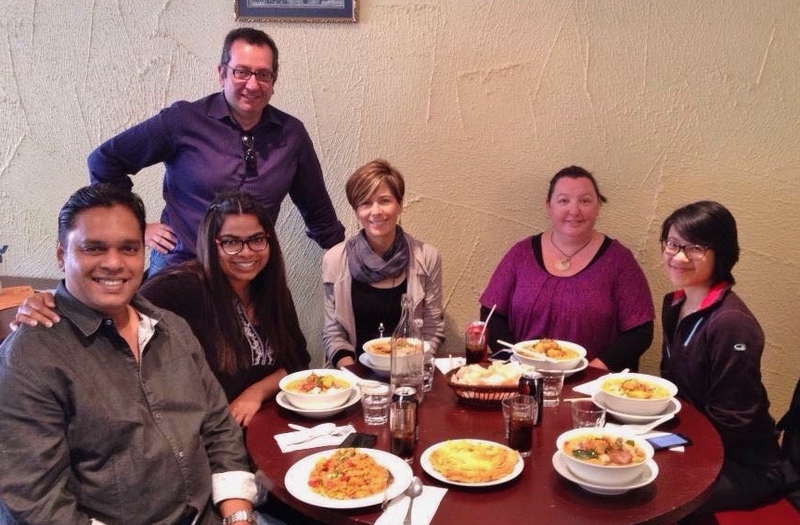 Here’s the Laksa Gang – L to R the cute couple from Travel and Beyond, the dashingly suave CBR Foodie, the well traveled Fine Eating, me and the lady with the awesomest blog logo nilbarcodefood. Two hours later, food was eaten, drinks were drunk, I was not and we were all outta there. 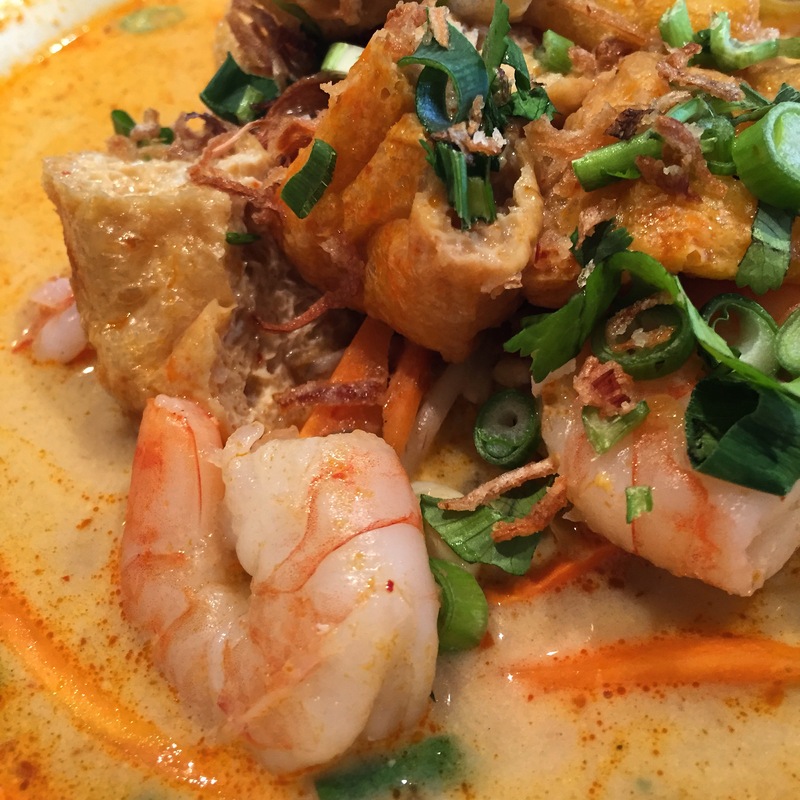 Plans have been set in place for another laksa taste test. Watch this space. 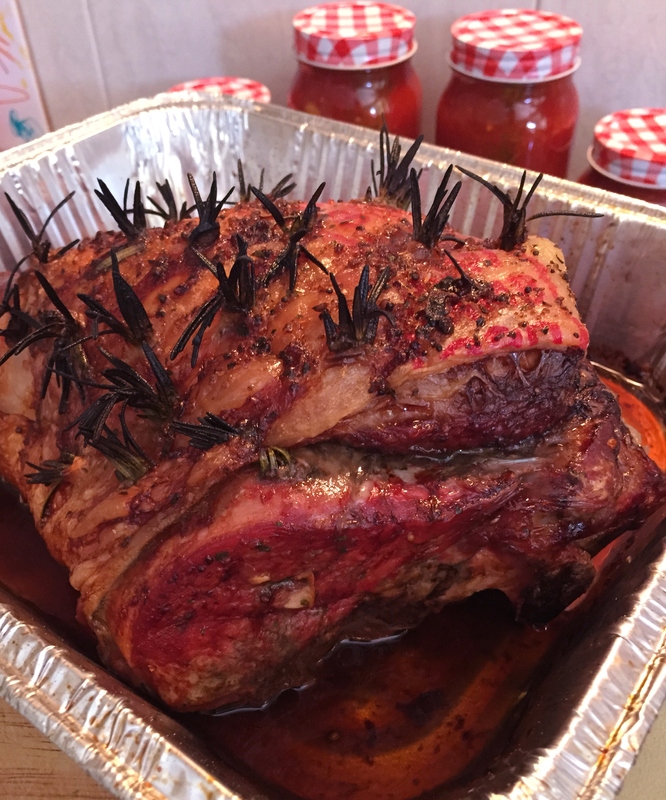 The last on my list of foodie adventures for the weekend was the slow Webber roasting of this leg of Cowra lamb from Bruce the Butcher. Slits were stuffed with slithers of garlic and sprigs of rosemary from my garden. A generous sprinkling of smoked salt from Spice and Co (how I love thee, smoked salt) and it was whacked onto a lowish Webber bbq over coals for approximately 4 hours. My poor neighbours had to smell that roasting for 4 hours. This is the glazed burnished golden beast that we were left with. 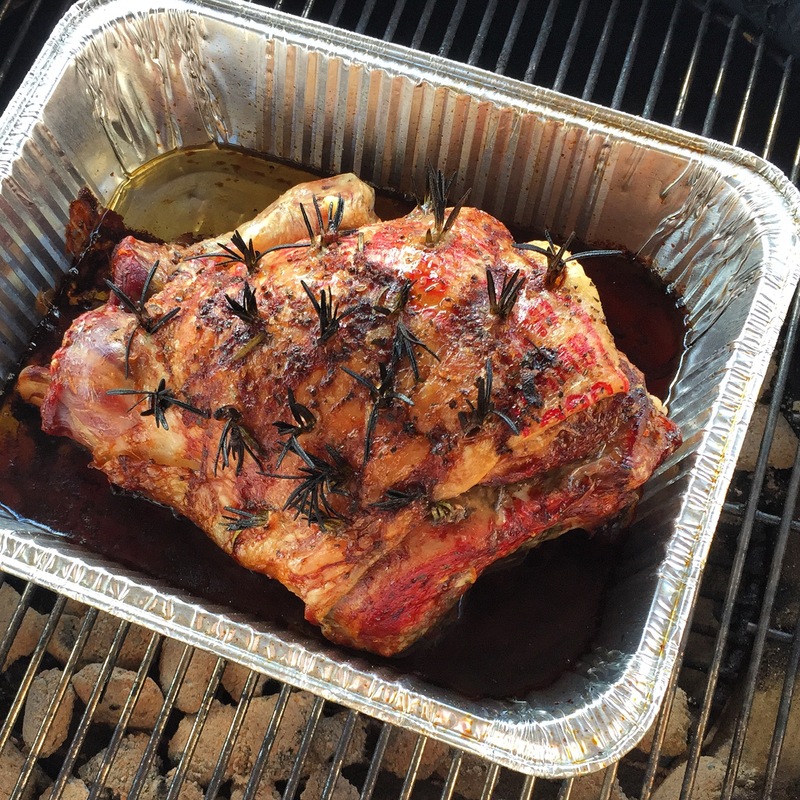 Is there anything on God’s green earth that looks as tempting and smells as sweet as a roasted leg of lamb? Possibly roasted pig. We ended up with 8 people at our dinner table that night, the next door neighbour, my 2 step daughters, Tweenies friend and us. Poor SO was a little troubled at how quickly they polished off his leg of lamb. He’d normally get at least 3 days of left overs out of that sized roast. He’s a lamb lover, you see, and I make him a roast leg of lamb once a fortnight. Anyway, a gravy was made out of those delicious golden juices, peas n corn were steamed and roast potatoes done. It was a feast for all who joined us. And that’s how it should be, a table full of chatter, plates being licked clean and contented sighs as they all left the table with bellies full of good homecooked food, and other tales to tell. It was a good weekend and I’m grateful for all I have, and who I have to share it with. Sounds like a wonderful weekend Fran! I can’t believe your poor cake though – I didn’t know you shouldn’t double a recipe so that is a good lesson for me!! Wasn’t it sad, Megan 😢 Yep, don’t double the ingredients! 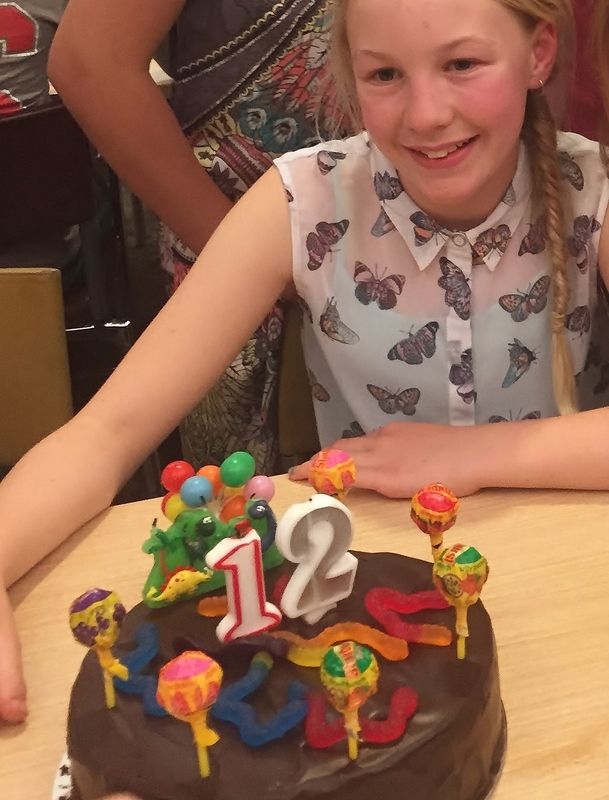 It’s not surprising that your beautiful daughter and friends preferred your cake!! You’re a fabulous baker!! And I had an awesome time with all of you at the laksa meet up. I didn’t realise you ordered the prawn laksa until I saw photos. Must have been to engrossed in my bowl!! 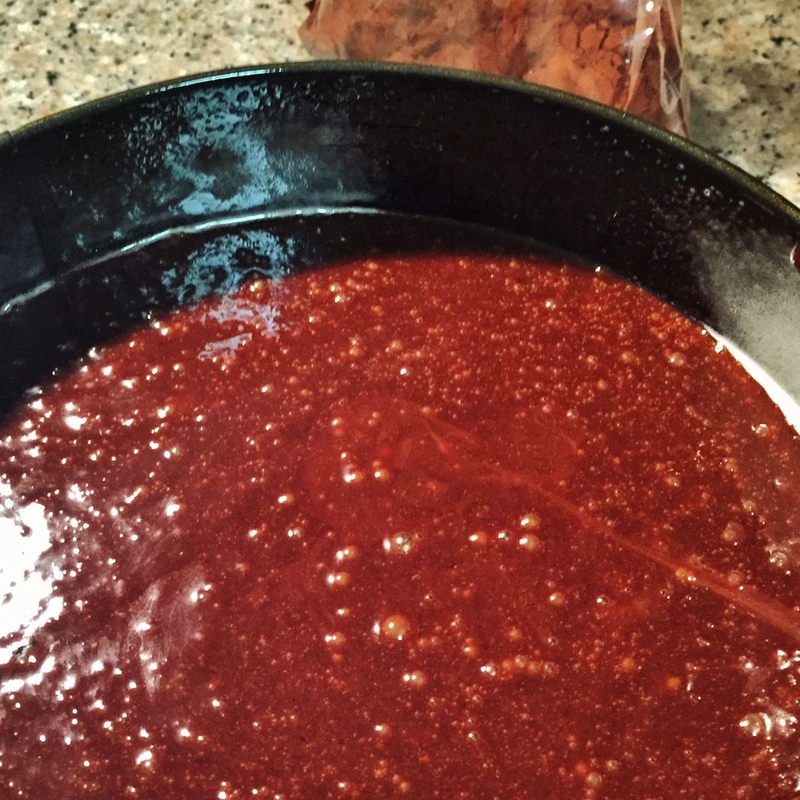 Can you please post the recipe for your delicious sounding (and looking chilli jam). I’m a bit of a laksa fan too, so can’t wait to hear the results of your official taste testing. I’m really enjoying my girl getting older, she’s a lot of fun. Aren’t you in Canberra as well? Very small town, Canberra, it sure is. Fran, what a bloody amazing weekend of eating you and the fam put in. I was drooling at all your wonderful photos. Tweenie is one pretty little lady, love her shirt…. Where did you get it? Laksa festivities looked fun filled too, I heart Laksa soooo much. Ive been going to Bamboo cafe for ever, the owner told me last week they are shutting down at Christmas time, I am devo, gonna have to get in on your laksa tastings to find a new joint to eat at. Looking forward to getting my hands on your chilli jam recipe too. 🙂 Hope you are having a wonderful weekend. The weekend sounds like a busy, but fun one. Sometimes the best tasting cakes don’t always look the prettiest. Happy belated birthday to your daughter.